Scripps Networks Interactive went all out with a lobby upgrade at the company’s Knoxville, Tennessee, headquarters. 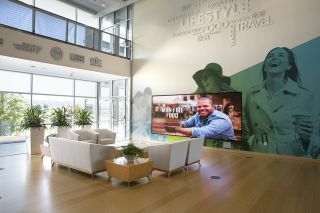 Leaning into their status a media provider, Scripps called on video collaboration company, Whitlock, to transform the lobby with a state-of-the-art multi-panel video wall. A lobby space is the first area of a headquarters building that any entrant will see, so it was important for the company to make sure their employees, clients, and guests are met with an experience that leaves a positive, relevant, and lasting impression. “As a space where employees, guests and clients pass through every day, the Scripps Networks headquarters lobby should represent the hip and forward-thinking culture of the media company,” said Erica Fox, account executive at Whitlock. Scripps was determined to revamp their space with state-of-the-art visual tech that would introduce a “wow” factor long since eroded from the multi-panel video wall that adorned the lobby for the past decade. The first complication in this endeavor was the nature of the lobby itself; as a ground floor space with towering two-story windows, natural light was sure to pose serious competition to any display. Another challenge? Scripps wanted their new display feature to remain cutting-edge for the next 10 years, a tall task for technology that typically evolves rapidly. Deadset on introducing a vibrant display feature into their lobby, Fox and the Whitlock team partnered with NanoLumens to install a NanoLumens Nixel Series display measuring 15.5 feet wide by 8 feet tall with a narrow pixel pitch of 1.2 millimeters. The display was built to be front-serviceable for ease of maintenance and Whitlock networked the display with a control system from Crestron that allows Scripps to straightforwardly operate the display for a wide range of purposes. Using the Crestron interface, Scripps can deliver live video presentations synced with in-wall audio systems, stream up to 10 live television channels onto the display simultaneously, and program diverse styles of content to engage and delight audiences. The display installation is safeguarded for Scripps by NanoLumens’ six-year warranty and their US-based team of support experts located not far from Knoxville in Atlanta, Georgia. Bolstering the case for NanoLumens was the brightness capabilities of their display technology, which held particular relevance in a lobby space that often found itself bathed in sunlight. Furthermore, while Scripps began the project quite budget-conscious, they came to appreciate the long-term value of investing in top-end solutions once Greg Moore, their director of facilities project management, visited the NanoLumens headquarters.